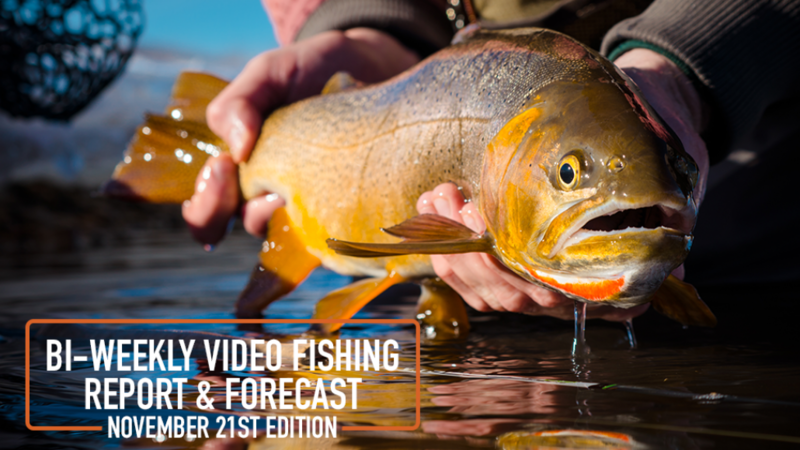 Trouts own Ivan Orsic is back to talk about the current river and fishing conditions throughout Colorado. With a long weekend of good weather ahead, we figured it was appropriate to get this out to y'all before the holiday. We're in that fall-winter transition period. Small bugs like midges and blue-winged olives will be the ticket on darn near every river. We're seeing great flows higher up on the South Platte at 11 Mile and the Dream. Deckers, while lower, is still fishing really well and has been producing some good dry fly action when the sun is present. For the freestones, don't neglect those big stonefly nymphs. We'll be closed on Black Friday, as we've chosen to #OptOutside and cleanup the South Platte. On Saturday and Sunday, drop by the shop to donate toys for our 2nd Annual Toy Drive. Prefer your River Reports in writing? No problem, be sure to check out our Fishing Information page for up-to-date fishing reports!